What are these redundant stylings that got removed from Noia Moon Options? Where is the useless find button? I do not remember seeing any such thing. If the theme changes the whole browser interface, why bother with native anything? I personally prefer the scrollbars to be changed, since I do not admire the MacOS scrollbar appearance. I would advise checking the commit log for such things. Goodydino wrote: If the theme changes the whole browser interface, why bother with native anything? I personally prefer the scrollbars to be changed, since I do not admire the MacOS scrollbar appearance. It's only an option in Noia Moon Options for those that want it. If you don't want it, don't enable it. Hi Lootyhoof!! thank for all your excellent job , i like your themes. If this is not so much could you please make a dark version of maxi 3? I like very much the light version and all the details is has but for me and some others this hurts my eyes , i will be glad if you can make a dark version of it, i know there is dark moon but i really dont like the look of the icons and I think a dark version of maxi3 will be even better than FT deepdark , thank you in advance and sorry for giving you more work to do . christian wrote: Hi Lootyhoof!! thank for all your excellent job , i like your themes. If this is not so much could you please make a dark version of maxi 3? I like very much the light version and all the details is has but for me and some others this hurts my eyes , i will be glad if you can make a dark version of it, i know there is dark moon but i really dont like the look of the icons and I think a dark version of maxi3 will be even better than FT deepdark , thank you in advance and sorry for giving you more work to do . christian wrote: If this is not so much could you please make a dark version of maxi 3? fillerup wrote: sorry but FTDeepDark will remain the best dark theme ever. I did look into this a long time ago, but unfortunately the license doesn't allow for anyone other than the original author to work on it, plus when I contacted them they weren't interested in adapting this to Pale Moon. That said though, anyone is free to make their own dark theme if they want. @Lootyhoof I understand your point i know about persona, but instead then could you make the icons on dark moon theme look more like maxi3 or 4? that would be nice 'cause i dont really like the icons on this theme (no offense of course ) and that is the main reason i ask you to do the dark version of maxi3, that will be a better version and not so simple as it look right now. - Could you make left pane thinner? as you see it takes big part of screen or maybe reducible. - Also you see the light background on the menu? i almost can't see the text. - The triangle on the "P" of palemoon menu is gone but just with this theme. I use Hide caption titlebar plus addon by the way if this help you figure it out a fix. Last edited by christian on 2018-10-15, 03:09, edited 3 times in total. The toolbar buttons for the Darkpitch theme have shapes more like those of Maxi3. 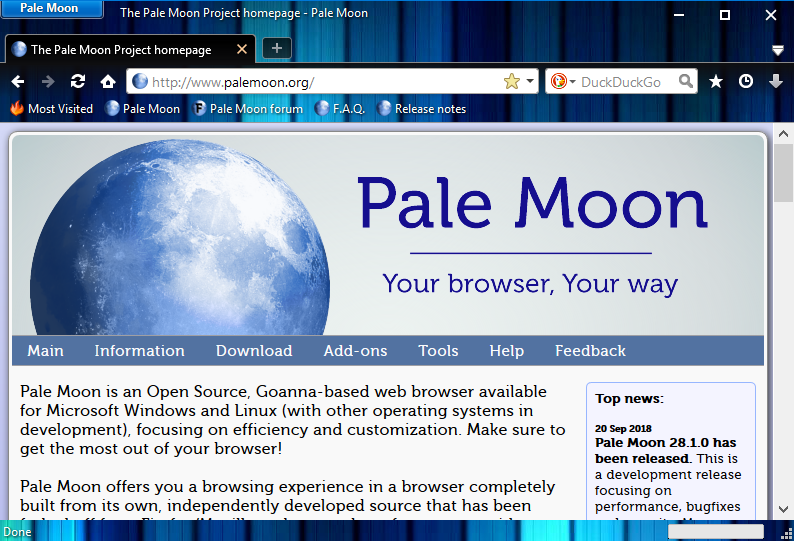 was it your work that developed the *new* Noia4 theme for Pale moon 28? if so is there any way at all to introduce the complete theme manager that the *old* Noia4 1.8.9 made use of with this new Noia? I just upgraded Pale Moon from 27.9.4, that version still supported the complete Noia4 package, 28 will not support the manager. This complete theme has been my default for years now since Aris first developed it. what would one have to do to allow the theme manager to run? Last edited by 55trucker on 2018-11-03, 14:36, edited 3 times in total. 55trucker wrote: is there any way at all to introduce the complete theme manager that the *old* Noia4 1.8.9 made use of with this new Noia? No. You should use Noia Moon Options in combination with Noia Moon instead. 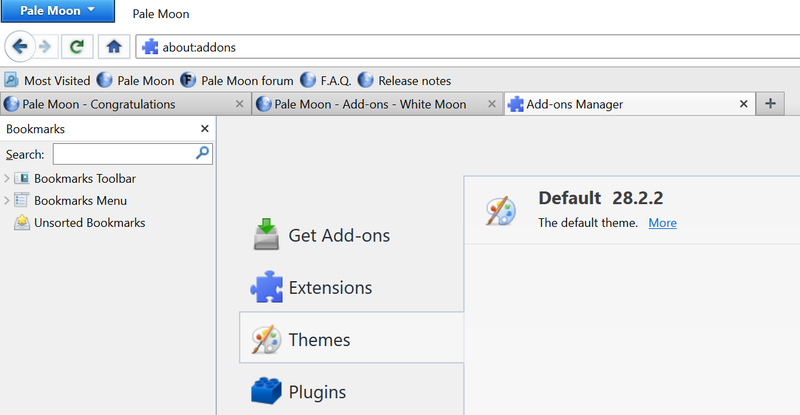 what, if possible, would one have to write where code is concerned to duplicate Noia4's theme manager for Pale Moon 28? Last edited by 55trucker on 2018-11-03, 19:17, edited 1 time in total. 55trucker wrote: what, if possible, would one have to write where code is concerned to duplicate Noia4's theme manager for Pale Moon 28? You'd need to create the relevant styles and insert them into the theme, then create an extension to manipulate those. Please understand that Noia4 has no bearing on Noia Moon; Noia Moon is instead based on Noia Fox and Noia Fox Options. The two are separate, and very much different from a code perspective. While the 2.0 release of Noia Moon did port across certain features from Noia4 (or at least inspire them), such features did not exist in the original base. I've also no intention of working on Noia4 either; the original releases of both Noia Moon and Noia Moon Options were in fact based on their Noia4 counterparts, however the base code was considered not as usable going forward as that of Noia Fox's, hence the switch. This is not a recent change nor will I ever decide to re-base it in such a way. seeing as I have never had the reason to look for anything else other than the original Noia4 (because it always functioned on the vs of Pale Moon I was using) this change comes as a bit of *sticker shock*. Not having that unique flexibility to custom alter the browser cosmetics to my liking the way the original gave me will take some getting used to. Last edited by 55trucker on 2018-11-03, 22:22, edited 1 time in total. 55trucker wrote: The two are separate, and very much different from a code perspective. While the 2.0 release of Noia Moon did port across certain features from Noia4 (or at least inspire them), such features did not exist in the original base. I've also no intention of working on Noia4 either; This is not a recent change nor will I ever decide to re-base it in such a way. I take it that is also the reason why Aris decided to drop the maintenance to his work, in his last post in Mozilla (2014) he stated that he couldn't keep up with the constant changes to the Firefox program, he also said that the addons validator was broken & he just lost interest in Firefox on the whole. Too bad he didn't notice that Pale moon still supported his work. I haven't found a theme for the browser that is as attractive & cosmetically flexible as this. Themes not specifically created for Pale Moon haven't worked correctly since (at least) the days of Pale Moon 15.x. There have been many changes to themes on Pale Moon over time that need to be accounted for in themes to be considered "supported". Just because they work in a minimal fashion does not imply support. There is a reason I've been updating the various themes I support over the years after all, ignoring any design changes I've made to certain themes over time. I'm having an issue with LittleMoon 1.9 on MacOS 10.14.1 and wicknix's PM 28 builds. Essentially, the URL bar suggestions list only appears once after a new window is opened, and the uBlock Origin control panel will also only pop-up once after a new window is opened. I can get it to work if I open the UI customization window, close it, and then try again, but I have do this every time I need to adjust a uBlock setting. I realize that the Mac builds are still not officially supported. These things do work on Windows with the LittleMoon them and on Mac with the default theme. Let me know if there's any other information you need from me. 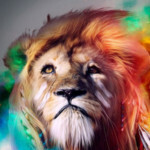 Last edited by asimperson on 2018-11-23, 07:09, edited 1 time in total. Aeromoon, Compact Moon (theme only), DarkPitch, Fox 2 The Moon, Littlemoon, Maxi3, Maxi4, MicroMoon, Moonfox3, Moonola, Nauticalia, Noia Moon (theme only), Opresto, PMChrome, PMOpera, Qute 4 PM, Qute Large, Qute Legacy, reinheit, Tangerinemoon, Tangomoon, White Moon and XMoon have been updated. This is to add support for tab audio indicators (currently in the Pale Moon unstable builds), and also to update the developer tools (in particular, the Developer Toolbar/GCLI and Responsive Mode). The tab audio indicator, much like in the default theme, can be clicked to switch been muted and unmuted modes. For Fox 2 The Moon in particular, also, experimental support for the Ambassador IRC client was added, both as extension and standalone application versions. Any feedback here would be appreciated given the experimental nature of these changes. asimperson wrote: I'm having an issue with LittleMoon 1.9 on MacOS 10.14.1 and wicknix's PM 28 builds. I've not managed to look too far into this unfortunately (partly due to time, partly because I don't interact with macOS that often). Does this happen on other themes? Did this happen on other macOS versions? Last edited by Lootyhoof on 2018-12-24, 18:49, edited 1 time in total. found a small little bug in White Moon - the string "Other Bookmarks" in vanilla PM is still called "Unsorted Bookmarks" with the theme installed. what's curious is that even after the theme is removed, the string remains "Unsorted Bookmarks"
fillerup wrote: found a small little bug in White Moon - the string "Other Bookmarks" in vanilla PM is still called "Unsorted Bookmarks" with the theme installed. what's curious is that even after the theme is removed, the string remains "Unsorted Bookmarks"
Themes don't affect language packs. Are you sure you didn't make any other change? Can an old version of ft deepdark be obtained anywhere to install in PM? Lootyhoof wrote: Themes don't affect language packs. Are you sure you didn't make any other change?